Great watch!! Husband loves his! Quickly becoming one of the most popular models, this watch features similar styling to the Navy SEAL 20th Anniversary watch series. A unique 'Blacked out' appearance with all black case and details highlights this magnificent timepiece.This rugged analogue watch with high contrast face details is built for action. With water resistance rated to fifty meters and featuring a rubber band for a comfortable, long lasting fit, this analogue time piece will go anywhere you want to take it. The screw down crown and flat plastic case back complete the package. Caseback: Screw down black carbon reinforced case back. I purchased this watch for my husband who has another Luminox watch that he LOVES (purchased from an authorized retailer in New York). He wanted the blackout because it has a little different look than his current watch. When we received the watch, we noticed that it was missing the warranty card that was included in the packaging with his first watch. The packaging also seemed like it was missing something. Nothing was sealed, the watch didn't have any sort of packaging to make us feel like it was a new watch. It came in the case like his other watch, but it was just floating in the case. There wasn't a film or any protective covering on the watch itself. I was a little skeptical, but the watch was in new condition so we thought maybe they had just changed their packaging since our last purchase. This is where we should have investigated more. The watch worked perfectly for about 3 months. Then once the weather started getting humid (summertime) the watch face would fog up completely to where you can not see the face itself. I called Overstock who, of course, was no help at all because we were outside of our 30 day return window. We are now sending the watch off to the manufacturer for repair and praying that this is actually an authentic Luminox and can be repaired. I would not be surprised if it was a fake considering our experience. Bottom line- I purchased a $300 watch that was defective and most likely a returned watch. If I had the warranty card that the watch was originally supposed to come with, I could send that off with the watch and it would be repaired free of charge by the manufacturer. NEVER buying from Overstock again. Ever. Horrible experience. I got this watch for my boyfriend who is a deputy sheriff. A lot of the officers wear the same black watches that have no style This watch is at least a little more fashionable and he says it's comfortable and easy to read the time. FANTASTIC WATCH...VERY DURABLE, AND ILOVE THE WATCH BUT HERE IS THE PROBLEM: I WON FIVE OF THESE WATCHES, AND THE BAND IS BROKEN ON ALL OF THEM, SOME WITHIN DAYS. THE WARRANTY PEOPLE ARE WORTHLESS BUT IF YOU DEAL WITH THIS REALITY, YOU HAVE A PHENOMENAL WATCH AS LONG AS IT LASTS...TRULY TRAGIC THAT YOU HAVE A MASTERPIECE BUT THE COMPANY JUST DOES NOT GET IT. A GREAT SWISS WATCH BUT A COMPANY THAT DOES NOT CARE ABOUT THE PEOPLE, JUST THE MILITARY, I GUESS LIKE THE SEALS. OBVIOUSLY, I AM AN ADDICT BECAUSEE I LOVE THESE WATCHES: TOO BAD THAT I HAVE FIVE MORE OF THESE WATCHES THAT ARE IN VARIOUS STATES OF DISREPAIR: I GAVE UP ON THE WARRANTY PEOPLE. PERHAPS, WE CAN PRAY FOR A NEW CONSCIOUNESS ATT HE REPAIR FACILITY!!! What can you say about Luminox that hasn't been said already! My son loved this gift and wears every day! Come from a military family and thisis a high quality, high functioning watch that anyone would love! What a cool look with the blackout edition! The illumination of the points of time in the dark is amazing! No wonder the Navy seal teams use it! Recommend if you want to be the best gift giver ever!!! 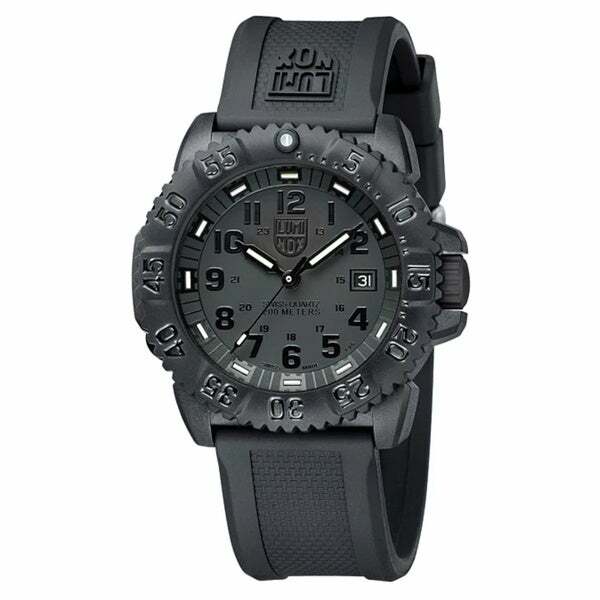 Third watch from Luminox and will buy a 4th. Great work watch, play watch, and casual watch. Inexpensive but great quality. I get compliments all the time. Great watch!!! It fits perfect!!! Husband loves it. Says it is the best watch ever. Comfortable. Would recommend it to others. Beautiful looking watch that also keeps great time. It’s both comfortable with a stylish look. Can be worn with any outfit from causal to formal. it's a Christmas gift for my father and I love it. Lightweight, handsome, keeps good time and night visibility can’t be beat. My husband has been watching this watch for quite some time.. He is a firefighter and needed a watch that was durable. "Do you have the manufacturer warranty with this watch?" Thank you for contacting us, bwillis3. This will come with a 30 day Limited Distributor warranty. Please let us know if you have any further questions. No they do not have a manufacturer guarantee. Only a 30 day limited distributor warranty. "Do you guarantee authenticity of all your luminox watches?" Hello wfelt, we do not sell knock-offs. Yes, this is an authentic Luminox watch. Thank you for shopping with us. "Does this watch glow blue at night like the other luminox blackout watch? Also, does it come with a case?" Hello, angkilt. This watch does glow like the other Luminox watches. This does come in a case. Thanks for shopping with us! l.b. "I would like to know about the illumination of this watch. What can you tell me? Also, you list the strap as simply being rubber. Is it just rubber or is a better material?" Hello emhye, this watch face has a reflective material placed in specifically such as at the hands and on the hour marks. The band is constructed of rubber, silicone and polyurethane. Thanks for shopping with us. "Need to receive this watch tomorrow??" Hello stephenpetrillo, At the end of the check out it will give you different shipping options if they are available. Thank you for shopping with us!